Located in the East Animas River Valley only 1.8 miles from Durango, this property is on a quiet county road where you can walk, jog or bike for miles! The views are incredible in every direction. This is a small cabin but it is very well appointed with everything that you need. There is a king size bed in the private bedroom and a sofa sleeper and small loft in the living area. Outside of the living area is a cute enclosed porch, perfect for enjoying the cool summer evenings. Satellite TV is connected to 2 LCD TV screens. Watch the rock climbers in the distance on the dramatic rock outcroppings or hike up there yourself on your own private hiking trail! The views are incredible in this beautiful river valley and the property is loaded with beautiful pine trees! Enjoy the convenience of being close to Durango restaurants and activities, while still in a quiet, cozy setting. 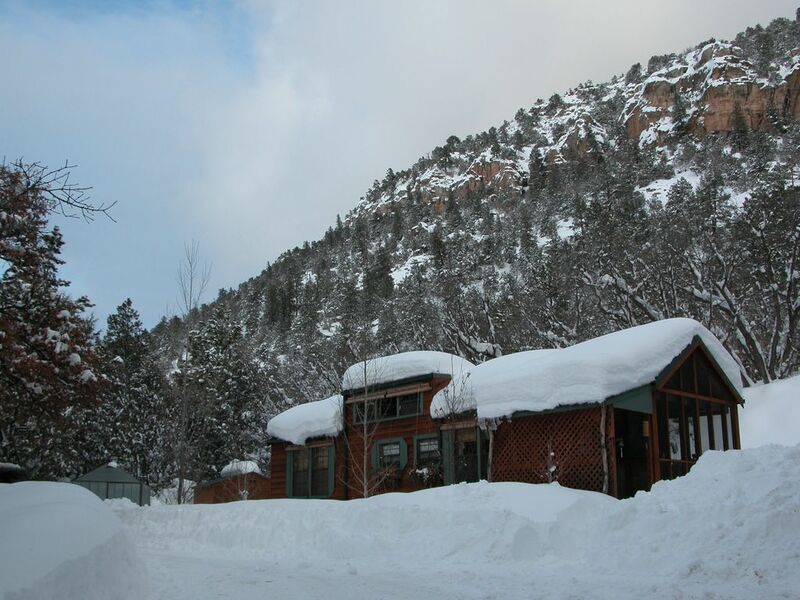 Experience the beauty and magic of Mesa Verde, skiing at Durango Mountain Ski Resort or taking the historic train ride on the Durango and Silverton Narrow Gauge Railroad! Enjoy Durango! Ask about using our covered private tennis court close by. Privacy and incredible views on your own private acreage, yet close to town! Your own hiking trail! This rental was great! The kids (ages 10 and 7) loved the loft area up the ladder! The house is located just outside the town and close to almost all activities around the area! It had snowed a ton and the kids had a great time in the backyard sledding downtown the hill! We didn’t see any deer but tracks were all over the snow. The house was stocked with coffee and small things as well as plenty of dishes, silverware, etc. There is a small hot water heater but with warning we were able to make it quick and not run out... we really didn’t spend much time in the house anyway. Everything was clean upon arrival and no issues to report. We would stay there again if we came to the area! Thank you Matthew for the wonderful review on the Cabin. I'm happy to hear you and your family enjoyed your stay! I hope to be able to welcome you back to the Cabin or one of our other homes along CR 250 in the not too distant future..
Our stay in the cabin was great. The cabin was clean and had adequate supplies, even though we had taken a lot of our own necessities. The mountain backdrop was beautiful. we traveled around Durango, Pagosa Springs and up CR 550. It was centrally located and easy to travel to town and around. The only other thing we really wanted to see was snow! Maybe next time. Thanks Nancy for the great review on the Cabin, happy to hear you enjoy your stay. The day after you left we got over 1' of snow and more is on its way! I hope you'll come and see us again sometime, we have five homes along County Road 250. We had a great time! Cute cabin! Had everything we needed. Close enough into town but still felt like we were out in the country. I'm happy to hear you enjoyed your stay in the Cabin and I hope you'll come back and see us again sometime, soon! Thanks for being a great guest Arlene! The cabin is comfortable and cozy. The bed is very comfortable. Kitchen is well stocked. The screened porch is excellent as we spent most of our time there. Very scenic setting. The only minor downside is that although the cabin is set back a ways from the road there still is traffic noise evident in the mornings and afternoons as people are coming and going to Durango. Overall very much enjoyed our stay. Hope you are enjoying a wonderful summer! Sweet cabin close to town, yet snuggled in the hills, makes the perfect location. Cozy, peaceful with hiking out your back door. The screened porch is the best room in the house. Great place to stay. Thanks for the great review Glenn & Carye. Happy to hear you enjoyed your stay and look forward to your return! Perfect base location to visit many wonderful attractions. Loved the country feel but yet close to town. Thanks Leslie for the great review on the Cabin. I'm happy to hear you enjoyed your stay! I look forward to welcoming you back to the Cabin or one of my other five homes in the not too distant future.